ALLY MAE has been on an NACD program since she was 10 months old after suffering a traumatic brain injury while in the supervision of a caregiver at 4 1/2 months of age. 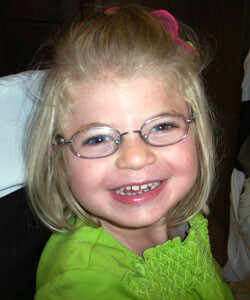 Ally also suffered retinal hemorrhaging in her eyes, two broken legs and a broken arm. Due to the trauma she began having infantile spasms (seizures with extremely damaging effects) and had to have bilateral shunts put into her brain. The doctors told her parents that Ally was blind and that they didn’t know if she would see, that her brain wouldn’t grow past that of a four month old. The phrase they frequently heard was “wait and see.” Doctors also gave the diagnoses of Cerebral Palsy and Mental Retardation, as well as other labels of things they said she would eventually have. Lesley and Joe refused to believe in this. They are ‘doers’ and were bound and determined to find something to help their daughter grow. She is now 5. In the past four years, her parents and brother, along with some very dedicated college students, have worked with Ally everyday. They work on her tactility and fine and gross motor skills. They work to improve her vision and her language. Mom remembers in the beginning sitting in her basement day after day with Christmas lights to help Ally track with her eyes. She remembers all the black and white patterns, the pictures, and the flashlights. Now Ally CAN see. Her ophthalmologist wants to keep seeing her every three months because he is so amazed at her progress. How far she has come!!! Miss Ally is a smart little girl with a future that looks so bright!!! Like most little girls, she will talk to you all day. Talking to people is one of her favorite things. Bob enjoys his conversations with Ally every time he sees her in Cincinnati. Ally enjoys swimming lessons and horseback riding. She attends preschool, loves books and reading, loves to have her picture taken, and is starting to draw. Our big push now with Ally is to get her moving. We have been working on building a foundation for walking for quite some time now. Three months ago Ally could not even stand independently for more than a few seconds. Watch her now! Talk about a success!!! Way to go Ally!!! Way to go Mom and Dad for working so hard to continue to help your daughter strive to reach her full potential!! And for Kyle who provides so much support to his younger sister–what a great big brother you are! We can’t wait to see what Ally will do next!